Gregory Garrett was born in Panama City, Florida. He attended the Columbus College of Art and Design in Columbus, Ohio, and later studied with artists Frederick C. Graff and Fred Leach in Cleveland, Ohio. After moving to Phoenix, Arizona, in 1979, he became a founding member of the Phoenix Art Press, a fine-art print company, and participated in group exhibits at the Phoenix Art Museum and the Scottsdale Center for the Arts in Scottsdale, Arizona. 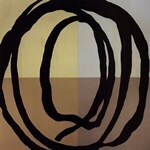 He relocated to Los Angeles, California, in 1987 and began exhibiting in local galleries. In 1990 he created Handpress International, a fine-art print studio and sales and marketing network. Over the next six years, he created works of art for Handpress as well as art dealers including the Billy Hork Gallery in Chicago, Illinois, the Brenda Kroos Gallery in Cleveland, Ohio, and Fresh Paint Art Consultants in Culver City, California. 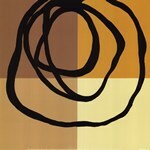 In 1996 Garrett closed Handpress to devote more time to painting and limited-edition printmaking. In 2000 he had a solo exhibit at the Glass Garage Gallery in Los Angeles. Garrett now lives in Echo Park, California, an art community near Los Angeles. Image Size: 48" x 25"
Image Size: 54" x 10"